According to Zogby Analytics, a firm that conducts independent, third-party research, “the American Massage Therapy Association (AMTA) continues to be the #1 choice for adults, who have had a massage in the past year, as well as massage professionals in terms of awareness, overall impression, credibility, respect and having the best trained and educated therapists.” On topics such as respectability, credibility, trust and networking, AMTA is better perceived than any massage organization, by large margins, both among consumers and therapists. Zogby conducted two online surveys in September–October 2018. One was to determine how both massage therapy organizations and large companies who employ massage therapists were viewed by adult consumers and the other to gather the opinions of massage therapy professionals. This was the third year Zogby Analytics conducted their surveys, and AMTA continues to be the top choice, by a large margin, over any other massage organization or company. AMTA remains the most trusted name in massage therapy by a ratio of more than 6-1 over any other organization among adults who have had a massage in the past year. Consumers who have had a massage in the past year prefer their massage therapist be insured by AMTA by nearly 4-1 over the Associated Bodywork & Massage Professionals (ABMP). Among massage therapists, the data is equally strong for AMTA. By a 5-1 margin, massage therapists view AMTA as more credible than ABMP, is respected by a 6-1 ratio over ABMP or Massage Magazine Insurance Plus; and, a majority (62%) of massage therapists prefer AMTA over ABMP when searching for information about massage. And, for the third year in a row, massage therapists named AMTA the most trusted name in massage therapy. The American Massage Therapy Association, the most trusted name in massage therapy, is the largest nonprofit, professional association for massage therapists in North America. It is directed by volunteer leadership and fosters ongoing, direct member-involvement through its 51 chapters. 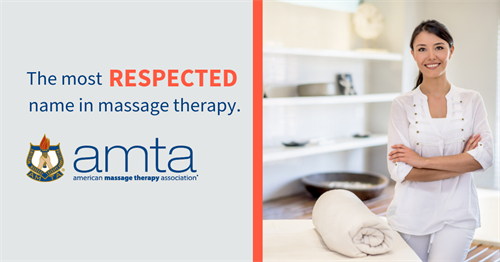 AMTA works to advance the profession through ethics and standards, the promotion of fair and consistent licensing of massage therapists in all states, and public education on the benefits of massage.